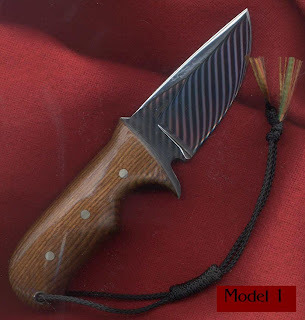 This model 1 has a 3.0" x 0.125" very fine satin-finished, selectively heat-treated 0-1 blade. The handles are stabilised Tiger Maple with brass & copper hardware and a thong hole. This is the knife that the maker carries. She sports a hand-rubbed, 3.75" x 0.125" selectively heat-treated 0-1 blade. The o.a.l. is 8.0". The handles are of cocobolo in the slimline style and the hardware is brass. She rides in a beautiful Kenny Rowe appaloosa-coloured sheath. This is a very popular knife due to her small size. 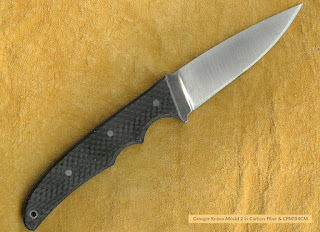 This knife sports a 2.5" x 0.125" hand-rubbed, selectively heat-treated 0-1 blade. The o.a.l. is 6.5". She'll do a lot of cutting chores and take up very little space. Next in green, dark green and white G-10 with a Scandinavian-styled grind. Next in Carbon Fiber, also with a Scandinavian styled grind. This is a slightly different version of the M-3, a bit more tactical. 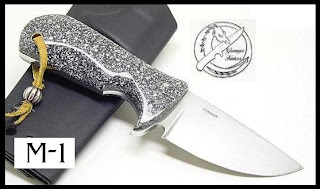 She offers a stainless blade, carbon-fiber handles, stainless hardware and a Kydex sheath. Dimensions are as above. And finally in a Japanese styled cord wrap over genuine ray skin. The Model 4 has a 4.0" x 0.25" stainless blade and is 8.5" o.a.l. 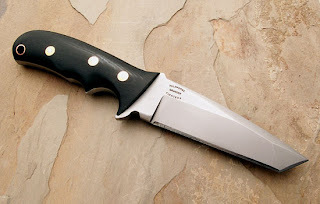 The basic model comes with black linen Micarta handles. 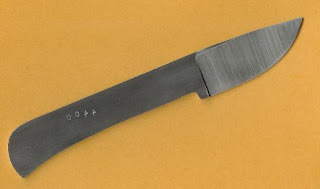 The Model 5 has a 4.5" x 0.188" blade and is 10.0" o.a.l. The knife is totally bead-blasted. She rides in a tactical Kydex sheath. 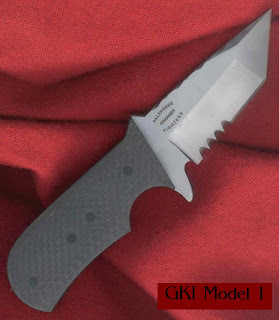 The Model 6 sports a 2.5" blade with an overall length of 6.625". 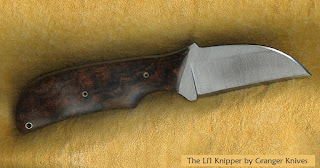 The Model 7, the Li'l Knipper by Granger Knives. 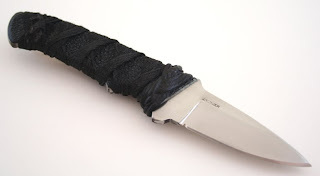 She sports a 2.25" blade and the overall length is 5.5". Shown here in O-1 tool steel and Desert Ironwood handles. it comes in a kydex sheath for maximum retention. This knife is the Presentation Grade Version of the M-9. She bears handles of stabilised maple burl and a satin-finished, quad-ground ATS-34 blade. Note: she is not a tanto. Dimensions are as described below. The M-9 is as described as above except that it has black canvas Micarta on a Slimline Handle sm and is totally bead-blasted. MPMT (Multi-position, Multi-tension sm) Kydex sheath that is ambidexterous, and has reverse-grip option, cross-draw option and locks for child safety. Battle ready with a pinch of flair. 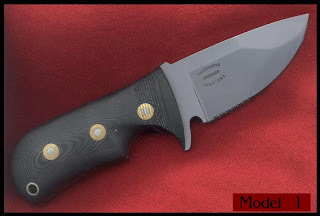 The M-10 sports a 5.0" x 0.25" blade of hand-rubbed ATS-34. 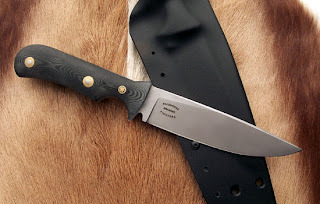 The handles are black linen Micarta that is satin-finished. The hardware consists of Loveless bolts and one thong tube. She also rides in a MPMT (Multi-position, Multi-tension sm) Kydex Sheath that is ambidexterous and has reverse-grip option, and locks for child safety. This is the basic M-10. The model 1 has a 3.0" x 0.125" very fine satin-finished, selectively heat-treated 0-1 blade. 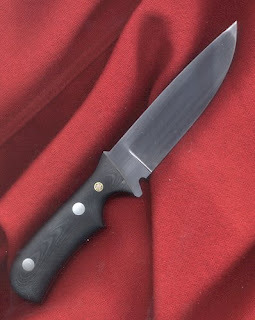 The handles are typically black linen Micarta with brass hardware and a thong hole. The o.a.l. is 7.5".